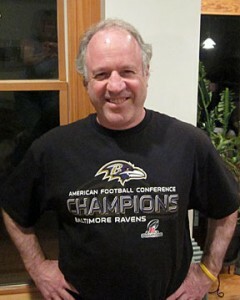 Johns Hopkins University mathematician Daniel Naiman is a die-hard Baltimore Ravens fan. Photo by Judy LaKind. Naiman, a professor and chair of the Department of Applied Mathematics and Statistics in the university’s Whiting School of Engineering, analyzed National Football League data from the modern era, which began in 1970. That was the first year when the league was divided into two conferences, the AFC and the NFC, with the playoff winners of each conference earning the right to compete in the Super Bowl. But what about the 2012 season, which will wrap up on Feb. 3 with the AFC’s Ravens facing off against the NFC’s San Francisco 49ers in New Orleans? Naiman has determined that in 2012, the NFC teams had their best year in knocking off AFC opponents since 1970, beating rival conference teams by an average of 5.6 points. Does that mean the Ravens are doomed? Beyond those wins, there is an interesting footnote from the first season of the modern football era, when, according to Naiman’s review, the NFC appeared “super strong” in defeating its AFC rivals by an average of 7.8 points, the biggest such margin in the modern era. Nevertheless, the 1971 Super Bowl was won by Baltimore’s AFC team at the time, the Colts, who clobbered the Dallas Cowboys, 16-13. Prof. Naiman is available for media interviews on this topic. Contact Phil Sneiderman. For each season, a helmet is displayed whose horizontal position represents the season, and whose vertical position indicates the average point difference between the AFC and NFC teams in inter-conference play during that season. 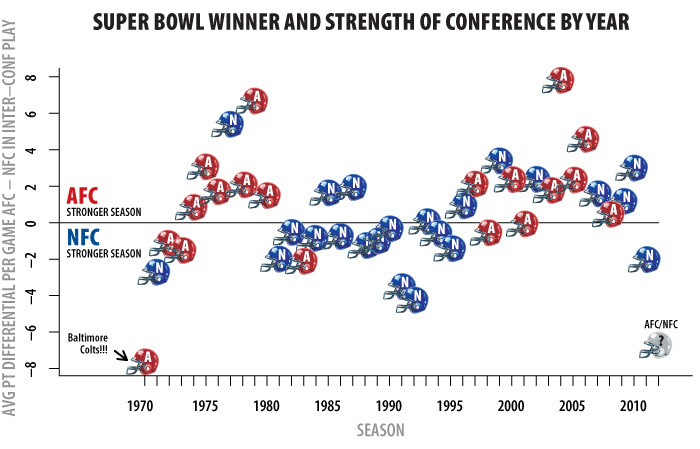 The helmet appears above or below the horizontal line depending on whether AFC scored more points, or fewer points, on average, than the NFC in their meetings that season. The winner of the Super Bowl for a given season is indicated by the color of the helmet.